As communities around the world face a growing water crisis, the need for lower-cost means to secure ample and clean water is becoming increasingly important. Natural infrastructure approaches—such as forest protection, watershed restoration, and sustainable management of landscapes—have a major role to play in confronting water crisis. As awareness grows on the linkage between the health of watersheds and their capacity to supply sufficient, clean water, watershed stakeholders— water utilities, business, government, and communities— face many challenges as they explore opportunities for integrating natural infrastructure approaches in managing their water resources. 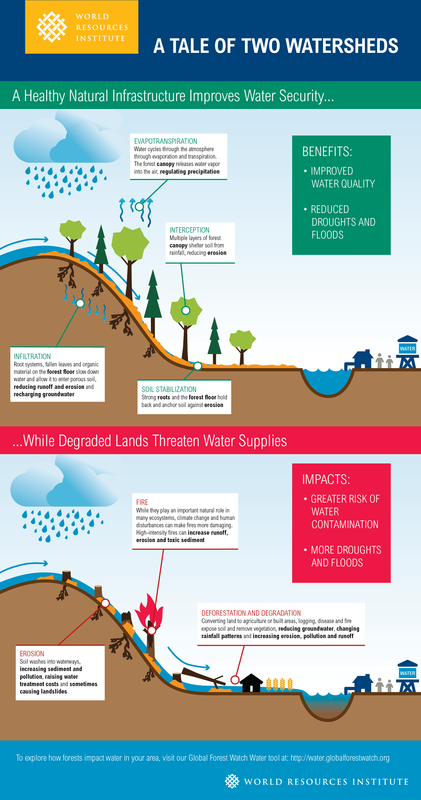 The infographic above illustrates the importance of natural infrastructure in securing the lasting health of watersheds that supply clean water. A healthy natural infrastructure improves water security through the presence of trees with strong root systems that prevent erosion and a lush forest floor that helps absorb and filter water. Degraded lands lack those natural systems, and are more likely to be affected by flooding and fires, which lead to more pollution and runoff in our rivers, lakes and streams.